(CNN) -- The assistant coach of Togo's national soccer team is among the victims of Friday's machine-gun attack on a bus carrying the squad to a tournament in Angola, the country's official news agency reported Saturday. Angola's official ANGOP news agency reported that assistant coach Hamelet Abulo and a Togolese journalist died Saturday. There were conflicting reports about the driver of the bus. Fraser Lamond -- regional medical director of SOS International, a group that transports injured people to hospitals -- said the driver was among the dead, but Togo government officials indicated he was still alive. The team was headed to Angola for the tournament when it was attacked near the border between Angola and the Republic of Congo. An armed wing of a separatist group -- the Forces for Liberation of the State of Cabinda (FLEC) -- has claimed responsibility for the attack and has threatened to strike again. CNN cannot independently verify the claim. Emmanuel Adebayor, the Togo team's captain and a star for England's Manchester City team, said he and his teammates met Saturday morning "before deciding that they wished to pull out of the tournament," the Manchester City Football Club Web site said. He was not injured in the attack, Manchester City said. "It's as if we've gone to war," said goalkeeper Kossi Agassa. "It's deplorable for Africa. I don't know what other countries will decide, but it's hard. Too hard for us footballers." 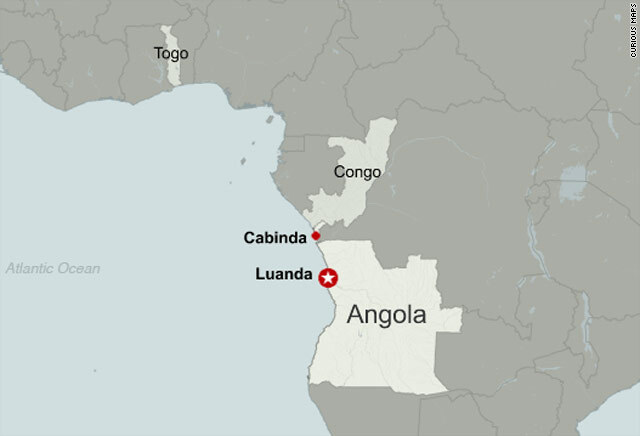 Angolan officials -- trying to assuage security fears that could dampen the war-torn nation's sporting aspirations -- vowed to heighten security, particularly in Cabinda, a disputed oil-rich enclave located within the Democratic Republic of Congo and the site of eight matches in the tournament. Togo had been scheduled to play Ghana on Monday in Cabinda. "We vehemently condemn the ignoble action, lament the loss of lives, and we reiterate our commitment to guarantee security so that the CAN ORANGE 2010 (tournament) will firm itself as a great sporting event and a manifestation of friendship and solidarity among the African people," an Angolan government statement said. Arriving Saturday with a high-level delegation to Cabinda, Angola's Prime Minister Antonio Paulo Cassoma insisted his government provided proper security. "Security was guaranteed. Nevertheless ... we will provide more security and protection to the delegations," Cassoma told Angola's TPA Television. Leaders of the Confederation of African Football were expected to meet Saturday with Cassoma "to take decisions to guarantee the smooth running of the competition," a statement on that organization's Web site said. Host nation Angola is scheduled to kick off the tournament against Mali on Sunday in Luanda. The tournament -- one of the world's biggest -- is Angola's first major sporting event since a 2002 peace deal brought the southern African country's decades-old civil war to an end. It also marks the beginning of a year in the spotlight for African football, with South Africa set to become the continent's first country to host the FIFA World Cup in June. The Angola tournament has been eagerly anticipated as an early chance to assess the form of African powerhouses such as Drogba and Toure's Ivory Coast, Essien's Ghana and Eto'o's Cameroon ahead of the World Cup. Football world government body FIFA said it was "deeply moved" by the incident and expressed "utmost sympathy" with the Togolese players. It said it expected a full report from the CAF on the situation. Togo striker Thomas Dossevi, who plays for French team Nantes, told CNN "armed rebels" with AK-47s had opened fire. "We were attacked by armed rebels who used Kalashnikovs. We had just passed the border and a couple of minutes later we were attacked from both sides. "We hid below the seats -- we had police protection in front and behind but we were attacked from both sides. As soon as I heard the bullets I went to the floor. ... The attack lasted for 10-15 minutes, " Dossevi said. Cabinda is located within the Democratic Republic of Congo. A strip of that nation separates it from Angola, one of the world's largest energy producers and a major supplier of petroleum and liquefied natural gas to the U.S. market. Togo is a strip of a nation that averages about 60 miles wide, nestled between Benin and Ghana in West Africa. It is smaller than the U.S. state of West Virginia.